Craftwell's eBrush Team joins to celebrate Latina Crafter's Anniversary! 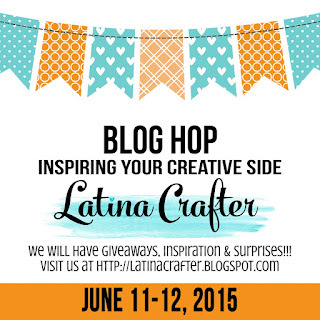 We are so excited to share the news about our monthly sponsor, Latina Crafter. I would love to share their unique story behind the scenes of this wonderful crafting company! 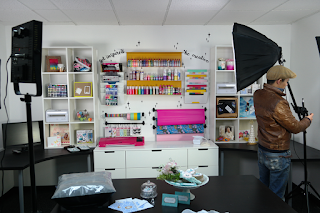 This is Diana's story of the birth of Latina Crafter. In June 2011, after been in the Scrapbooking Industry for over a decade, I started Latina Crafter, with the idea to provide stamps in Spanish. Funny that was all I had in mind to start. As a Latina I know how hard it is to find anything related to crafts and art in the Spanish language; products, tutorials, blogs, etc. and that’s the reason why Latina Crafter was born. I felt there was a real need to serve the Latina group and their needs. When we started, 4 years ago, we had with only four stamps sets: Felicitaciones, No hay nadie como tú, Para alguien especial & Familia. I tried to cover a lot with those sets because I was scared that would be all people wanted and no more. I needed them to cover a variety of themes and occasions and tried to do all with the four sets. Happily that was not the end of our story but only the beginning! Now we have around 300 exclusive stamp sets, dies, bitty buttons, stencils, wood veneers and other products to help with your creative projects, all that thanks God and our dear followers YOU!! In addition to stamps in Spanish now we have stamps with cute and whimsical illustrations that has sentiments in Spanish and English. It is wonderful to provide stamps and sentiments in both languages. We have been blessed with a great Design Team, an amazing Team of Illustrators and on top of all that the best customers on earth. We have customers all over the world and that’s simply awesome, something I never dream about it. We keep our goal of offering stamps in Spanish dear to our heart, but also we have going above and beyond to share our love and passion for this industry and we are crossing over to the English speaking community with great success and such a warming welcome that I didn’t expect and it has touched my heart, I feel like a happy and blessed girl. We will keep working hard and with passion to keep growing Latina Crafter and keep giving the service and love you want. Thanks for all your support. We are so happy to support Latina Crafter by sharing this wonderful story. This is such an inspiration to those interested in their dreams of starting something. It can be done! It is a wonderful industry that holds so much for so many! Hats off to the sentiment that started this business and continues to be the reason so many more start! So Happy Fourth Anniversary to you Latina Crafters! Please join the Celebration and Hop along!! NOW Some other news from Craftwell!!! We are so happy ! 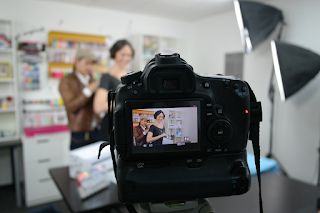 "As a bonus: here are 'behind-the-scenes' photos of our upcoming craft web show, 'Craftwell's Crafting Corner'! 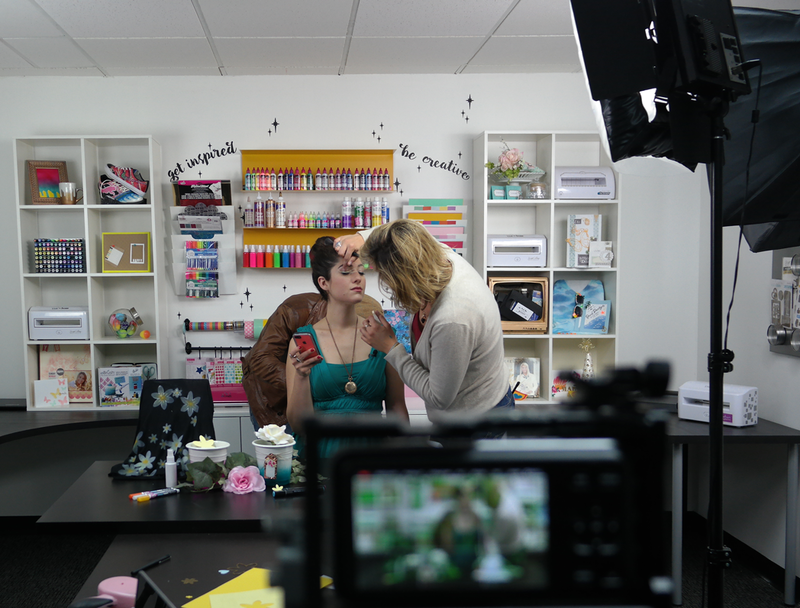 We loved working with our host & on-set crew to create a series that would provide you with quick & easy, but awesome DIYs using our Craftwell products! We're looking forward to sharing these fun tutorials with you!" 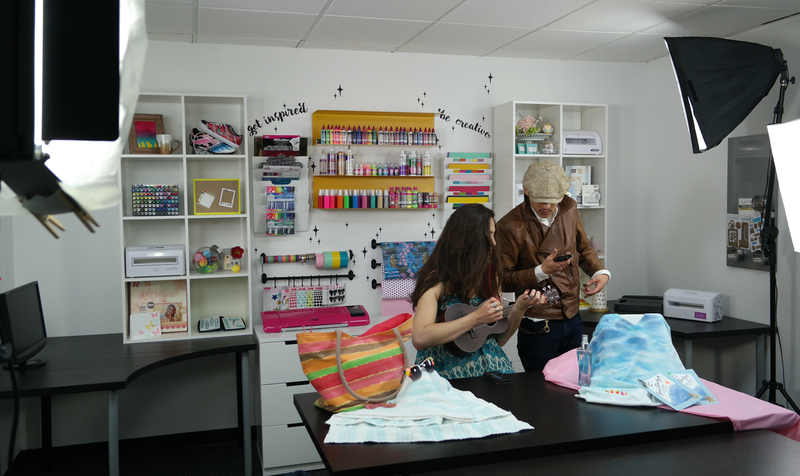 "Beautifully colored paints provided by ILoveToCreate & Tulip"
"Minor touch-ups & Instagramming between shoots"
"We're getting into the mood by playing a ukulele on set!" "Our host is ticklish when it comes to setting up a mic"
I also want you to know that we will be providing live broadcasts as well as our current library of videos geared to assist you with many of your Craftwell products. So much to come! Here is just one example of our videos introducing a new siphon accessory! Here is the link to our exclusive offer!!! yo listisima !!! felicidades Diana!!! Congratulations on your success, Diana.